Jacob: Blablabla. You DO stuff some of us are merely talking about. Soon though, we’ll join the ranks. Mike: Jacob - - tell us one specific badass-y thing our Swedish Humanities brothers and sisters have done that you admire. Jacob: They have aggregated 4.2 million objects from 40 ors, content that is available through their open API - - BOOM! Jacob: Lars, tell him how many objects you have delivered to Europeana - it’s like 100 times more than DK [Denmark] have. 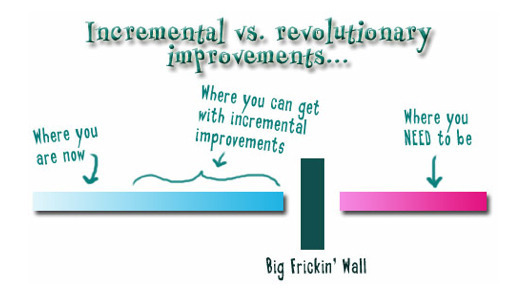 I love incremental improvement, but, as Kathy points out, if that Big Frikin’ Wall is there, incremental improvement ain’t going to make it go away.